You are here: Home / Learn / Does Elderberry Tea Curb Your Appetite? 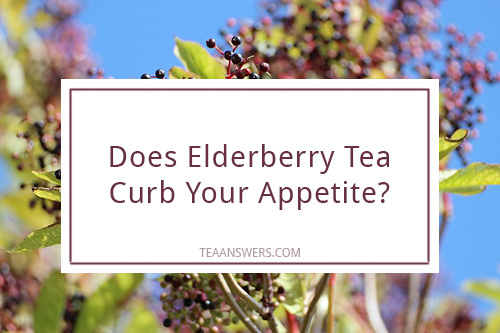 Does Elderberry Tea Curb Your Appetite? Elderberry tea has many healthy benefits. It’s only natural to wonder if the positive side effects include weight loss and curbing your appetite. If you are looking to eat less or to lose weight in a short time, elderberry tea may not be your best option. Although, elderberry tea will not curb your appetite, you may experience effects that can lead to weight loss from drinking elderberry tea. If you want to explore a new taste or access other health benefits, then elderberry tea may be a great option for you. Teas made from the fruit of Sambucus nigra are tasty and have many health properties. Elderberries grow on the elder tree in clusters of small, round, dark blue to purple fruit on red stems. Native to Europe, Africa, and part of Asia, the elder tree can be pruned to maintain the shape of a bush or shrub or allowed to grow to its natural height of up to 30 feet. Elderberries appear to have anti-inflammatory, antiviral and anticancer properties. Clinical studies around the world are testing elderberries for use in the common cold, flu, candida, mucus membrane and lung infections, HIV/AIDS, and seasonal allergies. Elderberries are high in vitamins A, B, and C. They also are a good source of flavonoids, which help to reduce inflammation. Some of the over-the-counter medications currently sold include elderberry syrup, lozenges, and tinctures, which are used to enhance the immune system during cold and flu season. If you don’t have access to an elder tree, dried elderberries can be purchased at natural health stores and over the internet. Drink a warm cup of elderberry tea for flu and cold symptoms. You may experience a good sweat, which may break a fever. Drinking the tea warm or cold will help with fluid retention (a bit of weight loss) as it gives your kidneys a boost to flush out excess water. If you’re feeling blue, drink a warm cup in winter and a cool glass in summer. Changing your outlook may get you to move more, which goes a long way to losing weight. Spent too long in the sun? Use cold elderberry tea compresses on your sunburn. It can also be used in the same way to soothe skin abrasions and rashes. Teabag with elderberries: Follow the directions on the box. Place 1 teaspoon (4 g) of dried elderberries in 1 cup of cold water. Bring water and berries to a boil. Turn off heat and let the tea steep for 10-15 minutes. Place 1 cup of fresh elderberries in 1 cup of cold water. Bring water and berries to a boil. Turn off heat and let the tea steep for up to 20 minutes. Strain the tea. Press the juice from the berries with the back of a spoon. Elderberries are tart. If you enjoy a tart-flavored tea, drink, drink, drink. If you want a sweeter tasting tea, add a little honey or sweetener of your choice. Elderberry tea may be kept cold in a refrigerator for up to 3 days. Do not eat the leaves, stems, or unripe elderberries. They contain chemicals similar to cyanide. Fresh ripe elderberries may be used, but they must be cooked (heated) before consuming. Elderberries may lower blood sugar levels and may increase the development of hypoglycemia. Elderberries may have a laxative effect and may increase the effect of other laxatives. Elderberries may stimulate the immune system and may decrease the effectiveness of immune-suppression medications. As always, consult with your health practitioner before consuming elderberry tea, to ensure it is safer for you.